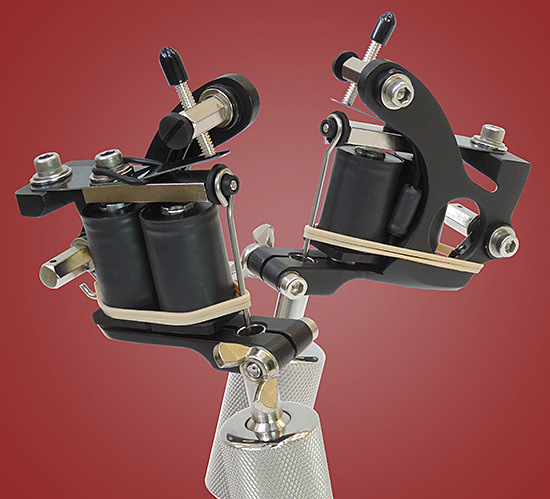 Bringing back the old, but adding a little new to make this the best Supreme tattoo machine ever! We started with an old style LEFT HANDED wide slot quick change iron frame and powder coated it in a rich, flat black. Then we bolted on old style hand wound ten-wrap coils. Add to that blue finish two piece springs without contact point, sterling silver contact screw, nickel plated binding posts, all stainless steel screws, and our famous stainless steel tube with built-in grip. We even threw in an oversized 1" stainless steel grip with 7/16" hole (#3146). Now that's a machine! Set up as either a liner or a shader. Also available with 8-wrap coils.